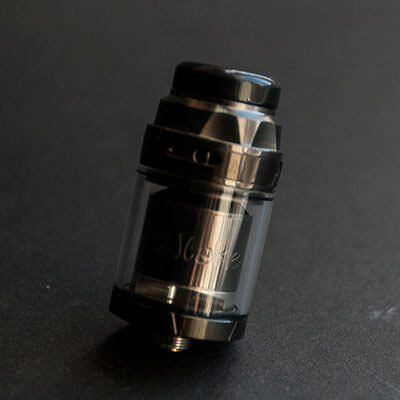 I received this Intake RTA free of charge directly from Augvape for the purpose of this review. Regardless of this, it will not color my opinion on this review in any way, shape or form. 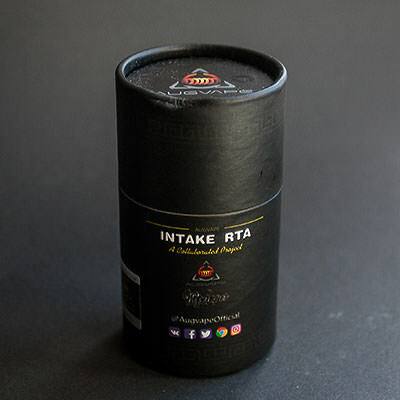 This doesn’t come in the usual box we are used to see, instead it comes in a cardboard tube, lined with foam that has cut outs for both the RTA that sits on top, and the spare glass and the goodie bag underneath. 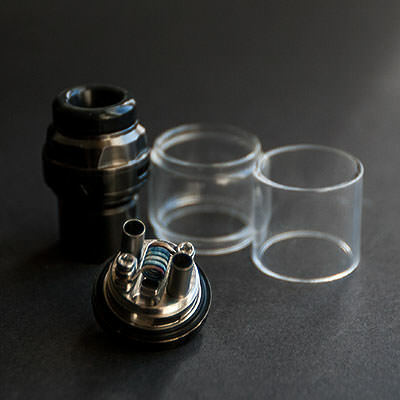 This is another collaboration between a YouTuber and a manufacturer and this time around Mike Vapes has been working alongside with Augvape to make this single coil RTA. The first impression is that it is well made with nice machining and that everything fits together nicely. 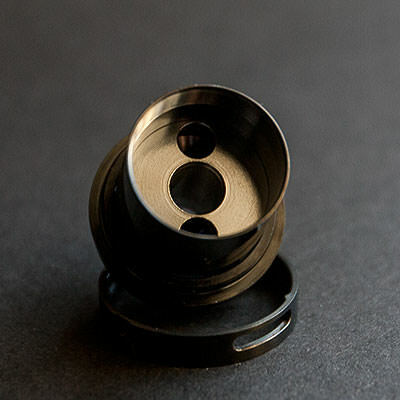 It has a top airflow that goes down into the chamber via tubes and this makes it close to leak free. The airflow works really good and it is very smooth. It is also easy to adjust to your liking. It is possible to make it really restricted as well as somewhat restricted wide open. It is basically a leak proof RTA since it got top airflow that goes through these tubes down into the chamber and comes out underneath the coil, and to my knowledge it does work really good. 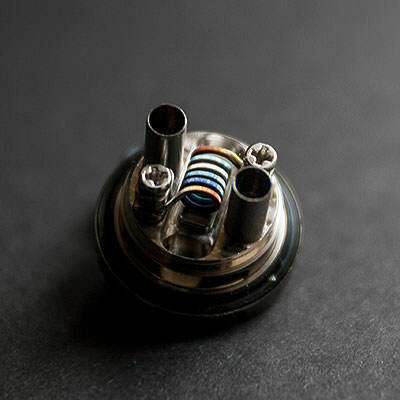 The deck is intended for single coil use only and it is easy to build on as well as easy to wick. You need however to know how to do the legs so they fit into the dedicated slots without giving you issues. Other manufacturers have decided to make it even easier with four post screws on the deck to let you use coils any which way you choose. Something I get though is a kind of dry vape and not as saturated as I wish I would get. Not sure why that is since I tried a couple of different wicks and still getting somewhat dry vape out of it. It works well and the wick is real saturated and I don’t get any real dry hits at all so the wick is working as it should. And this together makes me a little baffled to be honest, since it should be able to actually give me a more saturated vape. It does come with a short 810 drip tip and I have tried a few of my 810 drip tips and they fit nicely in it. 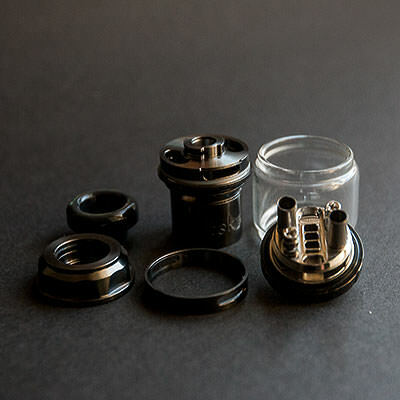 It does also come with a spare black Delrin 810 drip tip, as well as a 510 adaptor that sits flush with the top cap of the RTA. To fill it you just turn the top cap counter clockwise, the top cap comes off and you can fill the tank through the kidney shaped fill ports. Just be careful not to overfill it to avoid leakage thanks to that. 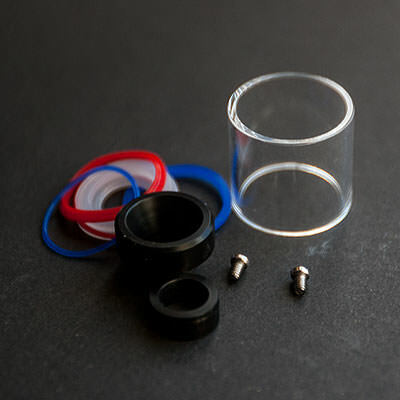 The amount of liquid it can hold with the bubble glass is 4.2 ml and with the straight glass it can hold 2.5 ml. 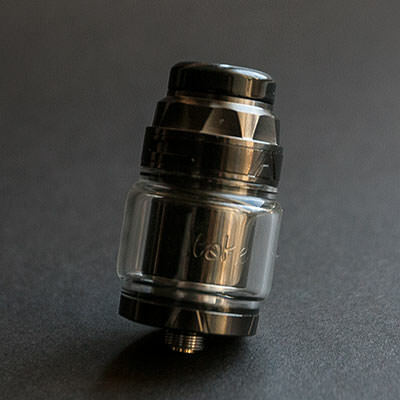 With the bubble glass it does become a bit wider with 27 mm at its widest point, and with the straight glass it will be 24 mm as the RTA itself. Overall this is a nice RTA and it is working real good and the flavor I get out of it is good, not astonishing, but still good for an RTA I would say. I think Augvape together with Mike Vapes have managed to come out with a good RTA that I think a lot of people will appreciate. It does provide you with good flavor but it could perform even better, and it is well made and the machining is flawless. 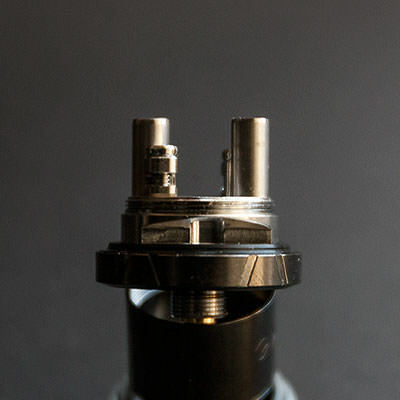 If you are in the market for a good single coil RTA I think you will like this, no doubt. It is well made and it does give you good flavor and that together with a nice price makes it attractive. Thanks dear. Tried different builds and that coil on the pic is the first one that i decided to use for the review. I agree, the flavor is good but not great, still enjoyable though. I don’t get a dry vape but I am very light on my wicking, pretty much like @SmilingOgre wick if you have see his video, just enough to dam off the wick ports, anymore than that and it gets dry for me. Would be great if they come out with a V2 with more airflow for people like us. I would like to see this in a 28mm version with more space in the deck and a domed chimney, gives more room for bigger intake tubes too. I’m not an RTA kind of guy at all really, i enjoy my RDA’s and i try to stick with them. Flavor would most likely have been a lot better with just a domed chimney. The airflow works for me wide open even though it is a bit restricted. The reason for that is all the single coil and MTL devices i have tested out recently. Good honest review. You call it as you see it. Can’t ask for more than that!! Thanks man. Is there any other way to do a review really? Honesty is what any of us that do reviews have, that and integrity. Not sure how I missed this one @Norseman, but you really, consistently put the good and bad, right out there in front. Great job.